Krishna Pendyala is an author, speaker, and advisor who helps executives, entrepreneurs, and their teams navigate and make better choices. For over three decades, he has inspired individuals and teams at Boeing, Carnegie Mellon, the Pittsburgh Steelers, UNESCO and UBS, and many others, using his simple, yet practical, framework distilled from his varied career experiences. His thought leadership is built on a long career of executive leadership, entrepreneurship, research, and product invention and development. Krishna’s transformational approach to personal and professional development has been featured on TEDx, Wall Street Journal, New York Times, Huffington Post, Pittsburgh Post-Gazette, and Inc. magazine among others. He is the author of the critically acclaimed book Beyond the PIG and APE: Realizing Success and true Happiness. In October 2014, he received the Distinguished Alumni Award from Indiana State University for his contributions to the world of business, his community and his country. He is now the founder & Chief Empowerment Officer of the ChoiceLadder Institute and co-founder & President of the Mindful Nation Foundation. He advises entrepreneurs and executives in the development their Judgment Quotient (JQ®) and other essential skills, so that their large and small choices align with their goals and values — and help them achieve lasting (extraordinary) success. Born and raised in India, Krishna received his B.S. in civil engineering from the Indian Institute of Technology. After moving to the U.S. in 1984, he received his M.S. in education foundations and media technology from Indiana State University, and has attended executive management programs at both Carnegie Mellon and Harvard universities. He is also a graduate of Landmark Education’s Curriculum for Living. Krishna lives in Pittsburgh with his wife and two teenage children. He enjoys photography, playing golf, RVing and kayaking. I’m an advisor to entrepreneurs and executives—people I call “driven and restless” achievers; people who are itching to grow, to improve, and create change—at every level of the organization. 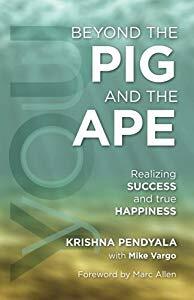 I’m also the author of The PIG and the APE: Realizing Success and True Happiness, a book that aims to raise our self-awareness by identifying the ways in which our natural drives get entangled with our egos—and sabotage our success. My background is not in sales or HR or communications. I’m not a psychologist, a therapist, or a neurologist. I started my life as an engineer, which means I’ve always been focused on solutions: How do you make something work better? I’ve spent not just a career but a lifetime collecting interesting parts and pieces from from a range of disciplines: neuroscience, social psychology, systems thinking, and behavioral economics to configure useful tools that are easy to use and easy to adopt by everyday people—and helped both individuals and organizations grow significantly as a result. Are you chasing pleasure or avoiding pain? Watch out for the PIG & APE running your life! Because everything we do is part of a larger system, it has a larger purpose—and every choice you make matters. Most people are simply unaware of what they do, or why—until they’re faced with the consequences of those actions, and then they kick themselves. That’s how I came up with the concept of Judgment Quotient, or JQ for short. Your JQ is your ability to make a choice in the heat of the moment that aligns with your values and goals. In other words, it’s the very thing you wish you had more of when you do something you regret. And I don’t mean just professional choices. Because for me, this is deeply personal. The choice to take your own life is not one to be taken lightly—and I made that choice, and failed, three times, between the ages of 15 and 18. My last attempt, in 1980, when I was 18 years old, left me paralyzed for six months and confined to a bed. That’s when I knew I needed to make another choice: To live. And I knew that if I was going to do this, I couldn’t just survive; I had to learn how to live. And while attempting suicide is a big decision, in truth, it was the many hundreds of small daily choices that put me on the road to recovery, and away from suicide for good. The choice to listen and connect with the people in my life. To reflect on the good things that were happening. To experience gratitude in thousands of tiny ways and moments. Every choice mattered, and continues to. You shouldn’t have to be clinically depressed to learn to live well via positive, productive, and aligned daily choices, and that’s what I’m dedicated to doing now—for myself and others. Here’s what I learned: You must decide that your life will be measured by you. And not by some external metric of success, but by the daily choices you make that align with who you are and what you care about most. That’s when you create a life that not only feels good, but brings you peace and fulfillment. You want great fruit? Don’t invest in the leaves; invest in the roots. When you engineer success from the ground up, you have less of a need for supervision and permission, and better, more consistent output—not to mention happier employees. I’m not a psychologist, a therapist, or a neurologist. I’m an engineer—which means I’m focused on better solutions: How do you make something work better? That includes the way you make choices. While everyone is obsessed with IQ, I believe it is Judgment Quotient, or JQ, is the most reliable factor for your success and quality of life. Like any engineer, I love piecing things together, and that means I love collecting different parts—and I collect them from a range of disciplines: neuroscience, social psychology, systems thinking, and behavioral economics. While I’m not an expert in any one of those fields, I collect the pieces and put them together to build and configure solutions that you might not find in any single area of study. Everything you do is part of a larger system, a larger purpose—and every choice you make matters. But what I find is that most people are simply unaware of what they do, or why—until they’re faced with the consequences of those actions, and then they kick themselves. The good news is that you can improve your Judgment Quotient, or JQ—your ability to align your actions with your values and goals, and when you do, it’ll change everything. We are not rational beings. We think we are—smart, capable, logical. But in fact, we spend less time making rational decisions, and more time rationalizing the decisions we made. So we don’t have rational minds; we have rationalizing minds. In order to think outside the box, you need to change the way you think. Your brain is the box—it was created over time by what you think, and, by how other people think, and the experiences you’ve had. You can’t just magically decide to think outside of it—you have to change the box itself. Advice without action is worthless. Everyone’s full of advice—you can even get it for free, tons of it. But you can collect all the advice in the world, even pay a high price for it, and if you don’t apply it in any real way, it cannot benefit you, period. Real change happens when leaders and teams can see and experience real solutions. Big decisions aren’t as important as you think. Whether to accept a job offer, move to a new city, or even purchase a home—these are big choices. But in fact, the much much smaller choices—how to respond to a colleague, whether to cancel a meeting or hit “reply all” to a triggering email—can have a far bigger impact on your career, your relationships, and your life. Think long term, act in the short term. It’s one thing to know where you want to go or be or achieve, but if you don’t align the choices you make each day with those goals, you’ll end up somewhere else (and you won’t like it). An a-ha moment can be misleading. Feeling the power of an insight can satisfy the need to feel capable and smart—but if you let that moment scratch the itch, you won’t achieve much. You need to apply that insight to action. Lasting success is engineered from the ground up, not the top down. Companies spend a disproportionate amount of attention and resources on “improving” their leaders, thinking it will solve their problems. But when you pour money into the top level, you yield very little in the way of real and sustainable results. When you engineer success from the ground up, however, you have less of a need for supervision and permission, and better, more consistent output—not to mention happier employees. Live life two days at a time. You might think we (can do well by) living life one day at a time, but I recommend two. Here’s why: If you only worry about today, you’ll be unprepared for tomorrow—and continue to kick your biggest problems forward, where they’ll be waiting for you day, after day, after day.